Uber Technologies Inc.'s purchase of ride-hailing and other software patents from AT&T Inc. topped off light deal activity in the first quarter of 2017 in the U.S brokered patent market. A transaction involving the sale of 86 patent assets by telecommunications giant AT&T to ride-hailing service Uber was the largest deal, in terms of the total number of patent assets, during the quarter, according to a review of data provided to Bloomberg BNA by Richardson Oliver Law Group LLP. Uber acquired AT&T patents covering technologies for messaging, billing and geolocation in ridesharing in March, Patent and Trademark Office assignment records show. In April, the company sought offers from patent owners in a fixed price patent purchase program aiming at boosting its patent portfolio in areas such as ride-hailing, maps, navigation and autonomous vehicle technologies. The San Francisco-based company has a total of 390 U.S. patents and pending applications, according to PTO assignment records. ROL Group tracks the reassignment of U.S. patents from various listed packages, comprising numerous U.S. and foreign patents and patent applications for sale, to identify when a sale is executed. Due to a lag in recording reassignments at the Patent and Trademark Office, ROL Group assumes that a given package is sold if any of the U.S. patents listed in the package are shown as reassigned in the PTO’s system. Brokers can help companies acquire patents in fields where competitors and likely legal adversaries operate, giving them defensive leverage against infringement claims. 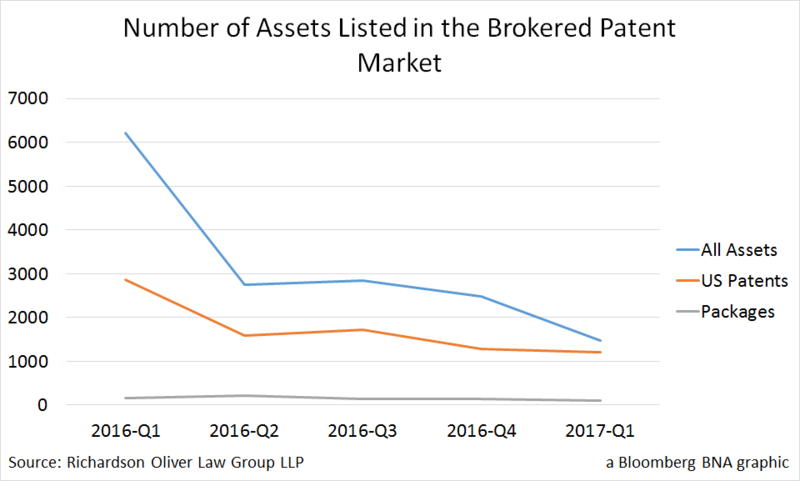 While the brokered market represents a small slice of the overall market for patent sales between entities, it can help highlight broader trends. 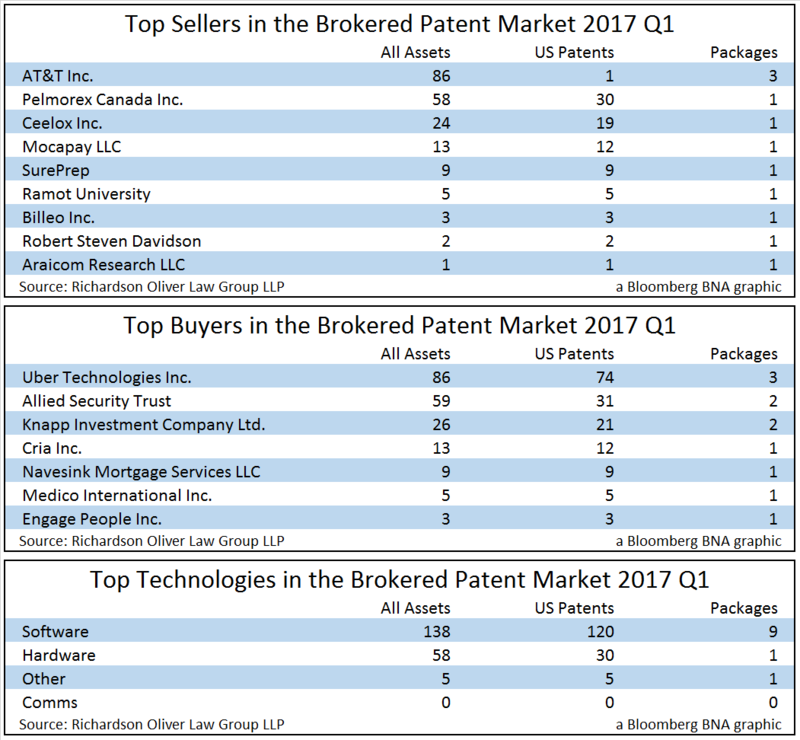 Application software was the top patent asset category in brokered market sales in the first quarter. There were 112 patent assets sold in six packages, compared to seven packages, including 97 assets in the fourth quarter of 2015. “Software patents are still in the basement only because of the fear of invalidity,” Mark Holmes, chief executive of Silicon Valley-based patent brokerage firm PatentBridge, said. Another large first-quarter transaction was the purchase by patent holding company Knapp Investment Co. Ltd. of 24 patent assets related to biometric identification and encryption technologies from Tampa, Fla.-based software company Ceelox Inc., ROL and PTO data show. Knapp also bought two assets covering on-demand video technology from an individual named Robert S. Davidson. The first quarter saw limited activity as the number of new assets offered in the market dropped 40.4 percent from the fourth quarter of 2016 and 76 percent from the same period a year ago to 1,476 new assets. Moreover, the number of patent packages listed for sale totaled 108, falling 27 percent from the fourth quarter of 2015 and 35 percent from the first quarter of 2016. 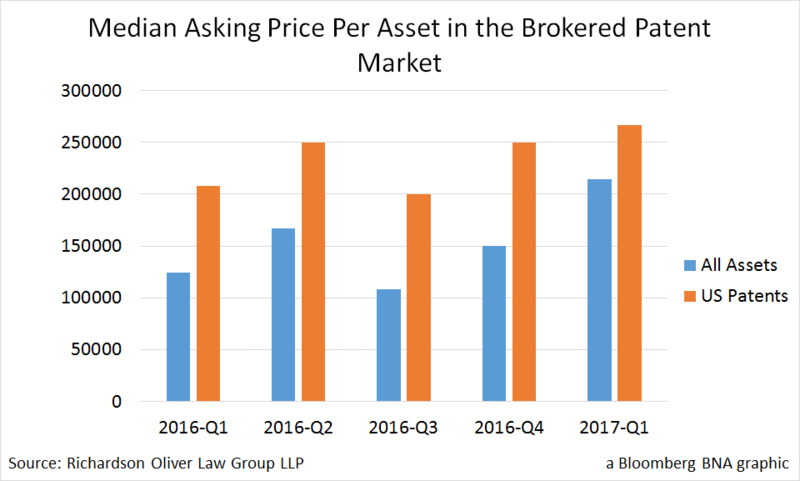 The median asking price per new asset listed by patent brokers was $214,290 in the first quarter. That reflected an increase of 43 percent from the previous quarter and 72 percent from the first quarter of 2016. The standard deviation or the amount of variation in asking prices was the lowest in the last two years, as asking prices are stabilizing, Richardson said. 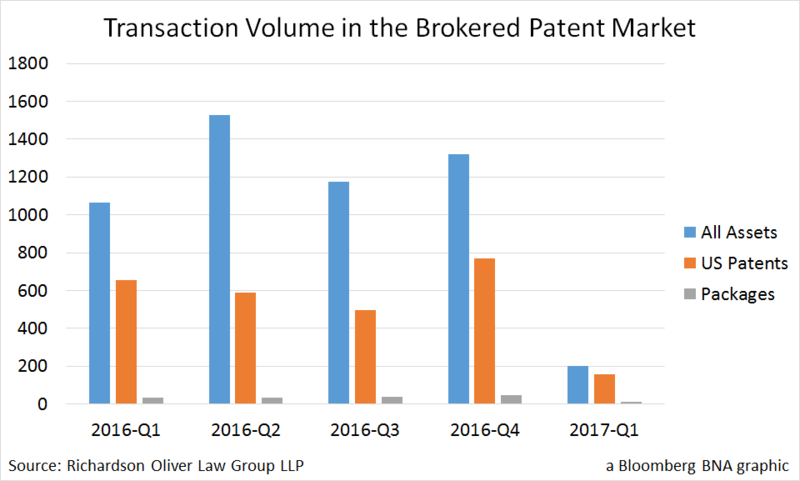 Brokers matched buyers and sellers for 11 deals on packages of related patents during the quarter, according to ROL data. Those deals totaled 201 assets, comprising 155 granted or pending U.S. patents, while the remaining amount represented granted or pending foreign patents.